I have three stories to tell about this dish. The first of which is that it didn’t contain sugar and it tasted good! When I say good, even my husband, who isn’t usually a fan of my sugar free food liked it (you can read more here about what my husband usually thinks of my food and here for my many posts on the subject of how, why and when I have gone sugar free – one reason being I’ve lost around 2 stone since quitting the sweet stuff). You might be thinking that salsa doesn’t contain sugar normally anyway, so what’s the big deal, but actually I looked at all the tomato salsa products available on a major supermarket online this evening and every single one of them contained sugar. It is low down the ingredient list which means it is not added in large quantities but it is still there. The second story is that I don’t know about you, but I’m not very confident when it comes to chillis. This time though I decided to throw caution to the wind and use a whole red dried out chilli that had been sitting in our fridge for months. If you are thinking this sounds slightly pathetic, it’s big news for me – I don’t think I’ve ever used a whole chilli in a recipe before. This is partly because I don’t think the kids would like it and partly because I’m usually scared that I will make our food too spicy. Actually though the secret to this salsa tasting good without sugar (for those sugar addicts out there) is the added chilli and garlic (as well as all the other ingredients) which give it all the flavour it needs. Finally, even without the added sugar there is nothing I could buy in a shop that could even begin to compare to the version I made myself (and I’m not saying I’m a master chef – far from it), the reason this salsa means so much more to me than any other salsa is partly because I made it myself, which is an achievement of it’s own and partly because of the stories behind each ingredient. Not in the original recipe, but I also added a squeeze of tomato puree (again bought in Southwick Square grocers) and a sprinkling of paprika (bought in the same shop as the oregano). I added both of these to make the salsa look a bit redder as it was looking quite pale. Peel the tomato skins off. 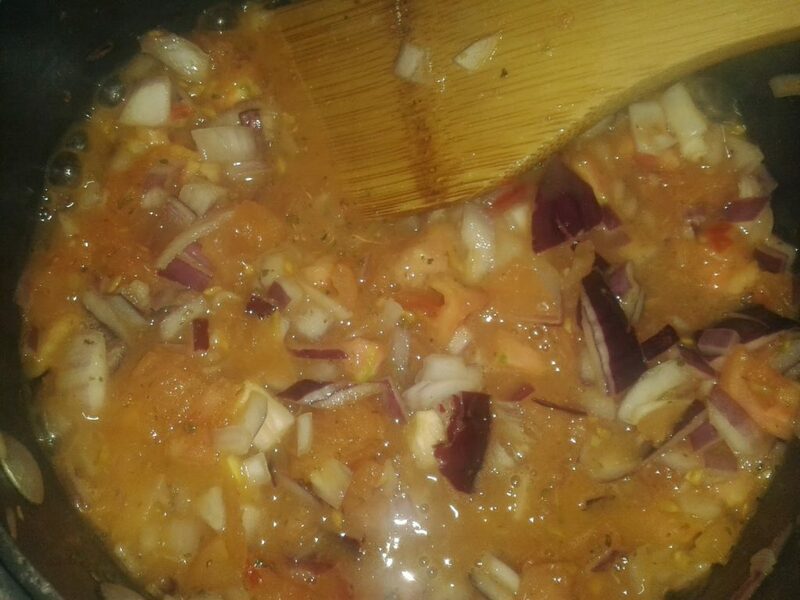 Mix all the ingredients together in a non-reactive saucepan and keep stirring every so often until cooked. My husband and kids had tortillas for dinner – corner shop bought and plastic wrapped (tick for sticking to my local shopping challenge, cross for my challenge to eliminate single use plastic in preparation for Plastic Free July) with chicken pieces (reheated from the freezer – left over from a roast chicken we had), homemade salsa (kids didn’t eat this..), homemade yoghurt (see here for method) and chopped up carrots, cucumber and peppers (bought from my local grocers). I had pretty much the same but I had mine with brown rice instead of tortillas. I have made tortillas from scratch before, following another recipe in my Mexican cook book, but I need to be a bit organised to do that and I didn’t do it this time round.. If you are reading this thinking that’s all well and good for me having all this hand picked/ home grown/ locally bought stuff, well it is very achievable for you too. How long does it take to plant a few chilli seeds and water them as they grow? Or to chuck a few garlic cloves in the ground, if you have a garden – not sure if they would work inside (although the way we have done it worked out quite expensive – we need a bit of a rethink on that)? It is a day out for us to take the kids fruit and veg picking and we can do something practical at the same time by picking onions at the end of the season when they are cheap to eat throughout the rest of the year, when they may not be as cheap – I haven’t actually price checked that though (or as long as they last us). You might find that your local shops are more accessible than the supermarkets, with shorter queues and friendlier staff, plus if you find the right shop you could save £££’s on herbs and spices, or failing that why not grow your own herbs? This entry was tagged bulk cooking, eco, Food, Frugal, Green, home made, plastic free, recipe, shop local, sugar free, supermarket free, thrifty, year of eco challenges. Bookmark the permalink. ← Why I think taking early retirement can help to change the world!